This July, nine members of St. Anne's Youth Group, Northland, Wellington, ventured to Pe'a Village, Tongatapu, in the Kingdom of Tonga. 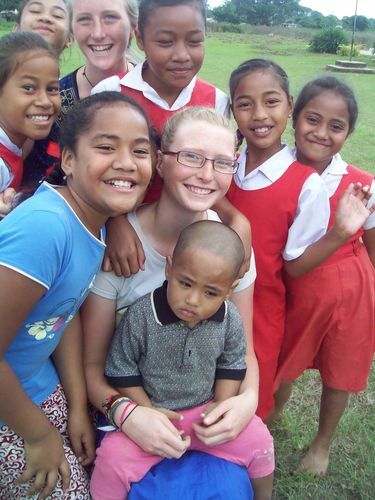 Build relationships with the people, churches and schools of PE'A village. Offer an experience of cross-cultural mission to the young people of St. Anne's. Encourage team building within the St. Anne's Youth Group. Share Anglican brotherhood with the parish of St. Paul's, Nuku'alofa. Encourage a stronger tie between St. Andrew's Anglican High School in Nuku'alofa, and the Ohariu archdeaconry. Encourage St. Anne's to be more aware of, and feel connected, to our parishioner, Tui Toumua's cultural heritage. Enhance the existing relationship between GPS Pe'a and Northland School, (our alma mater), previously established through our youth group leaders. Praise be to God, these objectives have all been fulfilled. Pe'a Village is a lovely collection of smiling, hospitable, generous folk who opened their community to us for ten days. We played and taught at GPS Pe'a, worshipped at Sa Paula Wesleyan church, made music together with the Pe'a Intermediate school's brass band, shopped at the local dairy, had a umu feast with Tui's family, worked at their plantation, supported the Pe'a choir's leadership at the monthly Tonga-wide Wesleyan Women's meeting, and wandered the roads making friends and meeting dogs, cats, chicken and pigs. The balance of giving tipped majorly towards the Pe'a-to-us side, and we felt both honoured and humbled. Beyond Pe'a's borders, we enjoyed the beautiful scenery, historic sites, beaches, markets and explored the capital, Nuku'alofa. At St. Andrew's Anglican High School we intruded upon their assembly, but were gifted by singing “Shine, Jesus, Shine” together. A tour of the school followed, making us aware of the material priviledges we enjoy in Wellington schools. At worship moments, we were aware of how much we have in common, despite the language difference. P. 404 was familiar ! The same lectionary Scripture readings were used in all denominations, even back in Wellington. We all love to sing, to rejoice over the children's contributions to worship, to pray and to enjoy fellowship. When we wondered if we were, in fact, 'doing mission', we remembered the Archbishop of Polynesia's advise to “just go, see, hear and be with the people”. At times, this put us outside our personal comfort zones. Fortunately we belong to a God who never leaves nor forsakes us, nor lets His little ones be put to shame. We hope the Tongans saw God in us, just as we saw Him shining through them. May the fruit of our journey continue to grow in both communities. We give thanks for the financial support given us through the TPMC. This, together with sponsorship from the Keleti Beach Resort, the generosity of our Northland odd- jobs employers, the hard work of the young people and the generosity of the Pe'a villagers, enabled the Trip to Tonga to be affordable for our young people. Our parting bit of advise for any contemplating a 'mission' trip, is to have local knowledge/ contacts and to be bold and responsive in relationship building. Submitted by Cathy Edge, 01/09/11.